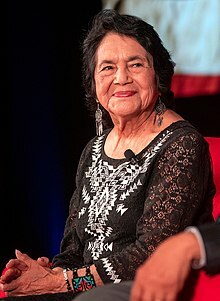 Dolores Clara Fernández Huerta (born April 10, 1930) is an American labor leader and civil rights activist who, with Cesar Chavez, is a co-founder of the National Farmworkers Association, which later became the United Farm Workers (UFW). Huerta helped organize the Delano grape strike in 1965 in California and was the lead negotiator in the workers' contract that was created after the strike. Huerta has received numerous awards for her community service and advocacy for workers', immigrants', and women's rights, including the Eugene V. Debs Foundation Outstanding American Award, the United States Presidential Eleanor Roosevelt Award for Human Rights and the Presidential Medal of Freedom. She was the first Latina inducted into the National Women's Hall of Fame, in 1993. Huerta is the originator of the phrase, "Sí, se puede". As a role model to many in the Latino community, Huerta is the subject of many corridos and murals. Huerta was born on April 10, 1930, in the mining town of Dawson, New Mexico. She is the second child and only daughter of Juan Fernández and Alicia Chávez. Juan Fernández was born in Dawson to a Mexican immigrant family, and worked as a coal miner. Later, he joined the migrant labor force, and harvested beets in Colorado, Nebraska, and Wyoming. When Huerta was young, she would hear her father tell stories about union organizing. After her parents divorced when she was three years old, she seldom saw her father. He stayed in New Mexico, and served in the state legislature in 1938. Chávez raised Huerta and her two brothers in the central California farm worker community of Stockton, California. Huerta's mother was known for her kindness and compassion towards others and was active in community affairs, numerous civic organizations, and the church. She encouraged the cultural diversity that was a natural part of Huerta's upbringing in Stockton. Alicia Chávez was a businesswoman who owned a restaurant and a 70-room hotel, where she welcomed low-wage workers and farm worker families at affordable prices and sometimes gave them free housing. Huerta was inspired by her mother to advocate for farm workers later on in her life. In an interview Huerta stated that "The dominant person in my life is my mother. She was a very intelligent woman and a very gentle woman". This prompted Huerta to think about civil rights. Her mother's generous actions during Dolores's childhood provided the foundation for her own non-violent, strongly spiritual stance. In the same interview she said, "When we talk about spiritual forces, I think that Hispanic women are more familiar with spiritual forces. We know what fasting is, and that it is part of the culture. We know what relationships are, and we know what sacrifice is". In 1955, Huerta helped Fred Ross start the Stockton Chapter of the Community Service Organization (CSO), which fought for economic improvements for Latinos. Due to her dedication and willingness to serve, Ross often delegated huge responsibilities to her. He knew she was capable of delivering the organization's message and promoting its agenda. "As she assumed responsibilities and stance that were traditionally held by white males, Huerta encountered criticism based on both gender and ethnic stereotypes". In 1960, Huerta co-founded the Agricultural Workers Association, which set up voter registration drives and pressed local governments for barrio improvements. In 1962, she co-founded, with César Chávez, the National Farm Workers Association, which would later become the United Agricultural Workers Organizing Committee. In 1966, she negotiated a contract between the UFWOC and Schenley Wine Company, marking the first time that farm workers were able to effectively bargain with an agricultural enterprise. Through her work with the CSO, Huerta met Chávez, its executive director. Chavez thought Huerta was smart, articulate, and self-starting, though had no love of “illegals” whom he thought hurt the cause of legal immigrants. But Chavez and Huerta quickly realized that they shared a common goal of helping improve the lives and wages of farm workers, so they co-founded the National Farm Workers Association. In 1962, after the CSO turned down Chávez's request, as their president, to organize farm workers, Chávez and Huerta resigned from the CSO. She went to work for the National Farm Workers Association, which would later merge with the Agricultural Workers Organizing Committee to become the United Farm Workers Organizing Committee. "Dolores's organizing skills were essential to the growth of this budding organization." The foundation was later changed to an affiliated agricultural workers organization. In an interview Dolores explained why she wanted to help the farm workers. She explained, she was able to get an inside look on how the farm workers were living and they were by far the most poverty stricken workers. She explained the farm workers were being paid little to nothing, they had no rights, they slept on the floors, their furniture was wooden boxes, did not have clean water, access to bathrooms, would work from sunrise to sun down and were not given any breaks. Many of these workers would travel where the crops were in season, meaning their children did not have a proper education and would often times work in the fields along with their parents. She explained that many women were often sexually assaulted by the land owners but were in fear to speak up because their family needed a job. Dolores explained that many of these land owners would justify them selves by saying "we are doing the farm workers and the public a favor by giving these people a job." she explained that the land owners had received the land and water for free and also expected to the labor for free. After Dolores saw the conditions these people were living in, she joined the organization. She explained, a laws must be passed in order for these people to get treated fairly which is why she worked hard and put constant pressure to get laws passed. With the help of the organization, she helped champion for the rights of workers in agricultural fields to ensure they were well paid and worked in better conditions. In 1965, Huerta directed the UFW's national boycott during the Delano grape strike, taking the plight of the farm workers to the consumers. She led the organization of boycotts advocating for consumer rights. The boycott resulted in the entire California table grape industry signing a three-year collective bargaining agreement with the United Farm Workers in 1970. On June 5, 1968, Huerta stood beside Robert F. Kennedy on the speaker's platform at the Ambassador Hotel in Los Angeles as he delivered a victory statement to his political supporters shortly after winning the California Democratic presidential primary election. Only moments after the candidate finished his speech, Kennedy and five other people were wounded by gunfire inside the hotel's kitchen pantry. Kennedy died from his gunshot wounds on June 6. In September 1988, in front of the St. Francis Hotel in Union Square, Huerta was severely beaten by San Francisco Police officer Frank Achim during a peaceful and lawful protest of the policies/platform of then-candidate for president George H.W. Bush. The baton-beating caused significant internal injuries to her torso, resulting in several broken ribs and requiring the removal of her spleen in emergency surgery. The beating was caught on videotape and broadcast widely on local television news.Later, Huerta won a large judgment against the SFPD and the City of San Francisco for the attack, the proceeds of which she used for the benefit of farm workers. As a result of this assault and the suit, the SFPD was pressured to change its crowd control policies and its process of officer discipline. Following a lengthy recovery, Huerta took a leave of absence from the union to focus on women's rights. She traversed the country for two years on behalf of the Feminist Majority's Feminization of Power: 50/50 by the year 2000 Campaign encouraging Latinas to run for office. The campaign resulted in a significant increase in the number of women representatives elected at the local, state and federal levels. She also served as National Chair of the 21st Century Party, founded in 1992 on the principles that women make up 52% of the party's candidates and that officers must reflect the ethnic diversity of the nation. Huerta was named one of the three most important women of the year in 1997 by Ms. magazine. She was an inaugural recipient of the Eleanor Roosevelt Award for Human Rights from President Bill Clinton in 1998. That same year, Ladies' Home Journal recognized her as one of the '100 Most Important Women of the 20th Century', along with such women leaders as Mother Teresa, Margaret Thatcher, Rosa Parks, and Indira Gandhi. She was recognized in 2008 by United Neighborhood Centers of America with its highest individual honor, the Jane Addams Distinguished Leadership Award at its National Policy Summit in Washington, D.C. She was awarded the UCLA Medal, UCLA's highest honor, during the UCLA College of Letters and Science commencement ceremony on June 12, 2009. In October 2010, Huerta was awarded an honorary degree by Mills College, who lauded her as "a lifetime champion of social justice whose courageous leadership garnered unprecedented national support from farmworkers, women, and underserved communities in a landmark quest for human and civil rights". The same month, she was awarded an honorary doctorate  by University of the Pacific, which unveiled an official portrait of her for the Architects of Peace Project by artist Michael Collopy. Huerta was awarded an honorary doctor of humane letters by Mount Holyoke College, where she delivered the commencement address, on May 20, 2017. Four elementary schools in California; one school in Fort Worth, Texas; and a high school in Pueblo, Colorado, are named after Huerta. Pitzer College, in Claremont, California has a mural in front of Holden Hall dedicated to her. A middle school in the major agricultural city of Salinas, California, which has a dense population of farm workers, was named in 2014 after her. She was a speaker at the first and tenth César Chávez Convocation. In 2013, Huerta received the annual Award for Greatest Public Service Benefiting the Disadvantaged, given by Jefferson Awards. Huerta also gave the keynote address at the Berkeley Law Class of 2018 graduation ceremony. In July 2018, California Governor Jerry Brown signed into law AB 2455, by Assemblymember Eloise Gómez Reyes, designating April 10th each year as Dolores Huerta Day. In March 2019, Washington Governor Jay Inslee signed a measure also designating April 10th each year as Dolores Huerta Day. Huerta is one of the subjects of the Sylvia Morales film A Crushing Love (2009), the sequel to Chicana (1979). She is portrayed by actress/activist Rosario Dawson in Diego Luna's César Chávez (2014). She is the focus of a 2017 documentary called Dolores. A middle school in Las Cruces, New Mexico is named after. La Academia Dolores Huerta. The school specializes in bilingual studies, Latin dance and folk music. Huerta championed women's rights in feminist campaigns during her time off union work. She also fought for ethnic diversity in her campaigns. Huerta was an honorary co-chair of the Women's March on Washington on January 21, 2017, the day after the inauguration of Donald Trump as President. Huerta married Ralph Head in college. During their marriage, they had two daughters, Celeste and Lori. After divorcing Head, she married Ventura Huerta, with whom she bore five children. Their son Emilio Jesus Huerta entered politics and ran for Congress. Her second marriage ended in divorce as well, in part because of the significant amount of time that she spent away from the family while campaigning and organizing. Later, Huerta had a romantic relationship with Richard Chavez, the brother of César Chávez. Huerta and Chávez never married, but the couple had four children during their relationship. Richard Chávez died on July 27, 2011. The Dolores Huerta Papers are a part of the United Farm Workers Collections at the Walter P. Reuther Library. There is also significant material related to Huerta in the Cesar Chávez Papers at the Reuther Library. ^ "Dolores Huerta". National Women's History Museum. Retrieved May 31, 2017. ^ a b "Biography: Dolores Clara Fernandez Huerta". National Women's History Museum. Retrieved July 11, 2018. ^ "Remarks by the President at Presidential Medal of Freedom Ceremony". Obama White House Archives. May 29, 2012. Retrieved May 31, 2017. ^ "Meet the 20 MAKERS Inducted Into the National Women's Hall of Fame". Makers. October 5, 2015. Retrieved May 31, 2017. ^ "Dolores Huerta". The Adelante Movement. Retrieved May 31, 2017. ^ "Sí Se Puede". Makers. Retrieved May 31, 2017. ^ "Dolores Huerta". Gale Group. Retrieved May 31, 2017. ^ García, Mario T. (2008). García (ed.). A Dolores Huerta Reader. Albuquerque: University of New Mexico Press. p. 8. ^ García 2008, p. 177. ^ Loya, Gloria (January 1998). "Considering the sources/ fuentes for a Hispanic feminist theology." Theology Today. Retrieved September 23, 2015. ^ García 2008, p. 9. ^ "Delta College Cultural Awareness Programs Presents: "A Morning with Dolores Huerta"". Delta College. September 22, 2010. Retrieved April 2, 2012. ^ Frank, M. "Dolores found her calling as an organizer while serving in the leadership of Stockton Community Service Organization (CSO)", "Dolores Huerta: "Sí, se puede—We can do it."." File: Dolores Huerta. Available: Archives of Labor and Urban Affairs, Ruether Library, College of Urban, Labor, and Metropolitan Affairs, Wayne State University, Detroit, MI (1987). ^ Rose, Margaret(1990). "Traditional and Nontraditional Patterns of Female Activism in the United Farm Workers of America." Retrieved September 23, 2015. ^ a b Biography.com. "Dolores Huerta". Archived from the original on August 5, 2011. Retrieved May 7, 2011. ^ a b Dolores Huerta Foundation (November 16, 2013). "Dolores Huerta." Retrieved September 23, 2015. ^ "In the Orchard of Dolores Huerta". The Attic. Retrieved July 3, 2018. ^ a b Brown, Monica (2010). Side by Side/'Lado a lado': The Story of Dolores Huerta and Cesar Chavez. Harper Collins. ^ Guadalupe, Patricia (June 6, 2018). "'Death of our future': RFK's assassination set back Latino civil rights, says Dolores Huerta". NBC News. Retrieved March 29, 2019. ^ "La Voz de Aztlan - Volume I Issue 6". Aztlan.net. Archived from the original on July 19, 2011. Retrieved July 25, 2011. ^ Carpini, Michael (January 1993). "The Year of the Woman? Candidates, Votes and the 1992 Elections". Political Science Quarterly. 108: 29–36 – via University of Pennsylvania Scholarly Commons. ^ "The Year of the Woman, 1992". History, Art & Archives | United States House of Representatives. Retrieved January 26, 2018. ^ "DHF History". Dolores Huerta Foundation. Archived from the original on January 20, 2012. Retrieved January 23, 2012. ^ "About the Dolores Huerta Foundation". Dolores Huerta Foundation. Archived from the original on January 23, 2012. Retrieved January 23, 2012. ^ a b "Dolores Huerta :: Biography". Dolores Huerta Foundation. Retrieved January 23, 2012. ^ 100 most important women of the 20th century (1st ed.). Des Moines, Iowa: Ladies' Home Journal Books. 1998. ISBN 978-0-696-20823-2. ^ Puffin/Nation Prize for Creative Citizenship, official web site. ^ "Kappa Delta Chi National - Honorary Members". Kappadeltachi.org. Retrieved July 25, 2011. ^ Author unknown (2007). Two Recipients Share This Year's Award. Community of Christ International Peace Award, 2007. Retrieved on August 3, 2007 from "Archived copy". Archived from the original on July 23, 2012. Retrieved August 3, 2007. CS1 maint: Archived copy as title (link). ^ Human Rights Leader Dolores Huerta Endorses Clinton Archived July 25, 2007, at the Wayback Machine, May 18, 2007, Clinton campaign news release. ^ "2008 Democratic National Convention: Remarks as Prepared for Delivery by Dolores Huerta, Civil Rights Leader". Prnewswire.com. August 27, 2008. Retrieved July 25, 2011. ^ "Legendary Labor Leader Dolores Huerta to speak at Mills College Convocation". Mills College. Archived from the original on January 7, 2011. Retrieved January 23, 2012. ^ "Dolores Huerta Honorary Degree Conferral Open to the Public". Archived from the original on December 12, 2012. ^ Cook, Rachel (April 26, 2012). "Dolores Huerta will be given Medal of Freedom, White House announces". Bakersfield Californian. Archived from the original on May 3, 2012. Retrieved April 27, 2012. ^ "Democratic Socialists of America :: Our Structure". Democratic Socialists of America. Retrieved January 23, 2012. ^ "About EQCA :: Board of Directors". Equality California. Archived from the original on July 12, 2011. Retrieved January 23, 2012. ^ "Viva Dolores Huerta!". Claremont Colleges Digital Library. Retrieved January 26, 2018. ^ "10th Annual César Chávez Convocation with Dolores Huerta". University of California Santa Cruz College Ten. April 30, 2013. Retrieved June 12, 2013. ^ Moreno, Carolina (June 20, 2013). "Dolores Huerta Receives National Award". Huffington Post. ^ "Governor Brown Signs Bill Creating Dolores Huerta Day Honoring Labor and Civil Rights Icon". Assemblymember Eloise Reyes. July 19, 2018. Retrieved December 21, 2018. ^ "April 10 designated 'Dolores Huerta Day' in Washington state". King5 News. Retrieved March 24, 2019. ^ CHICANA. Retrieved from http://www.wmm.com/filmcatalog/pages/c269.shtml. ^ A CRUSHING LOVE. Retrieved from http://www.wmm.com/filmcatalog/pages/c771.shtml. ^ "'Dolores' Comes to U.S. Theaters Beginning Sept. 1". Dolores The Movie. Retrieved March 15, 2018. ^ Richard, Garcia (1993). Dolores Huerta: Woman, Organizer, and Symbol. CALIF HIST 72.1. pp. 56–71. ^ a b Quinones, Sam (July 28, 2011). "Richard Chavez dies at 81; brother of César Chávez (He helped César Chávez build the United Farm Workers into a political and agricultural force. He organized the California grape boycott in the late 1960s.)". Los Angeles Times. Retrieved July 30, 2011. ^ "Walter P. Reuther Library Dolores Huerta Papers". reuther.wayne.edu. Retrieved March 15, 2018. ^ "Walter P. Reuther Library UFW Office of the President: Cesar Chavez Records". reuther.wayne.edu. Retrieved March 15, 2018. Amsler, T. R. (Summer 2007). 'Si, Se Puede': Hayward teachers gain concessions and a valuable ally. Rethinking Schools, 21(4), 11. Felner, J. (Jan/Feb 1998). Dolores Huerta. Ms, 8(4), 48–49. Rosenburg, R. (Editor & Director) (1996). Women of hope [Videocassette]. Princeton, NJ: Films for the Humanities. Schiff, K. G. (2005). Lighting the way: Nine women who changed modern America. New York, NY: Hyperion. Telles, R & Tejada-Flores, R. (Directors) (1997). Fight in the fields [videocassette]. San Francisco, CA: Paradigm Productions. Dolores Huerta Celebrates 80th Birthday with Call for "Weaving Movements Together" – video report by Democracy Now! Michals, Debra. "Dolores Huerta". National Women's History Museum. 2015.